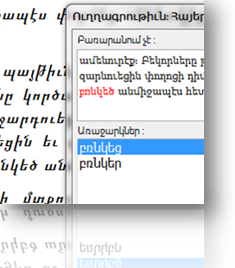 Armenian Spell-checker in both: Classical and Reformed orthographies. This combined package contains the add-ins for Microsoft Office 2007/2010/2013/2016 Word and Outlook. The package also contains a few newly designed UNICODE Armenian fonts, an Armenian Thesaurus, and the Extended Armenian keyboard drivers.